You'll explore and learn at Alcazar de Segovia and El Transito Synagogue and Sephardic Museum. 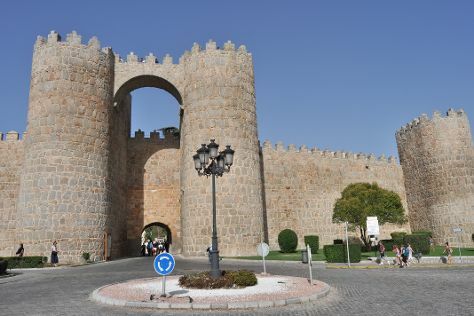 Your inner history buff will appreciate The Walls of Avila and The Four Posts. Explore the numerous day-trip ideas around Madrid: Avila (Iglesia de San Martin & Cathedral of Avila), Toledo (Senda Ecologica de Toledo, Iglesia de San Andres, & more) and Catedral de Segovia (in Segovia). Spend the 9th (Tue) among lush scenery at Alta Ruta Guadarrama. Spend the 13th (Sat) exploring nature at Centro de Educacion Ambiental Arboreto Luis Ceballos. There's much more to do: hike along Chorrera de Despanalagua, identify plant and animal life at Parque Natural Hayedo de Tejera Negra, learn about winemaking at Bodegas Tierras de Orgaz, and explore by horseback at Caballos la Vereda. For traveler tips, ratings, photos, and other tourist information, use the Madrid route planner. If you are flying in from Australia, the closest major airport is Adolfo Suárez Madrid–Barajas Airport. In April in Madrid, expect temperatures between 22°C during the day and 9°C at night. Finish up your sightseeing early on the 21st (Sun) so you can travel back home.